Monthly Trinity students: $30 / day or $50 for both days. Born November 28, 1947 in Baguio City, Philippines and the youngest of six children. Earliest exposure to martial arts was as a first grader in 1954 where ARNIS was taught as part of the physical education in the elementary grades. The VISAYAN style (waray) of arnis was learned in Tacloban City, Leyte, as part of the extracurricular courses. An offshoot of this art is a game called “SATO” using the long and short stick and playing rules comparable to baseball. 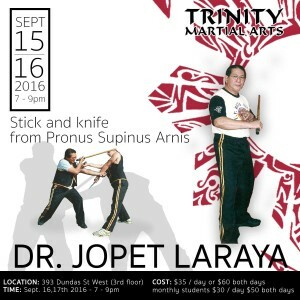 When the family moved north, he learned the ILOCANO style of arnis. He was also exposed to different styles of Chinese boxing from the parents of his Chinese classmates (Roy Lao, Teddy Yoro & Eliseo Young) A polish priest, Fr. Tom Bilzak, taught him some combat judo. In high school, he belonged to the “DRAGON SOCIETY”, a gang of high school students driving one-speed bikes. Fist fights and more often fighting with knives or sticks were frequent occurrences. He joined the BETA SIGMA FRATERNITY in 1963 of the University of the Philippines. The elite group, the U.P. Beta Sigma Kung-Fu Karate Klan, headed by Johnny F. Chiuten, Jr., was the enforcing arm of the fraternity. The son and grandson of kung-fu masters in their own right, Master Johnny Chuiten was instrumental in moulding his martial arts training in all aspects. Concurrent training in the Shotokan style of the Japan Karate Association under Sensei Kunio Sasaki was also made available to him. Several colleagues and fraternity brothers exposed him to CHOY LI FUT, TAI CHI, PA KUA and HSING-I. Basic SEVEN PRAYING MANTIS was taught to him by Nelson Guerrero, top student of Shakespear Chan. When the grand old man of Chinatown, Master Lao Kim, retired from his duties as Chief Instructor of the Hung Sing Athletic Association he eventually started teaching privately to a select group of students. His top student , Master Johnny Chiuten, was able to persuade him after several years to accept Jopet as his student. His training started with Lao Kim in 1965 and every so often he would be given an updgrading training by Johnny, as Master Lao Kim ( 104 year of age in 1988) had become afflicted by blindness. Full contact sparring was emphasized in the fraternity martial arts group. As Johnny Chiuten instructed the secret agents of the National Bureau of Investigation in the Philippines, he often used Jopet as the training “dummy” of the agents for their grading tests. Other colleagues who helped expand his knowledge of different martial arts include Ben Sto. Domingo (Aidido, Judo & Kendo), Noli Nolasco (karate), Rene Navarro (Tai Chi), Boygee Ganza (Karate). With migration to Canada, he joined the JING MO KING FU CLUB in Toronot, headed by Sifu James Lore & Sifu Jack Chin. With the pressure of university studies in Guelph, his training was limited to once a week driving both ways from Guelph to Toronto. While in Guelph, he taught marital arts classes at the YMCA. He moved to Oklahoma in 1973 for a year and also held classes at the local YMCA. With his return to Canada, he resumed his training at the JING MO CLUB. He set up his private small animal clinic in Oakville in 1976 and started teaching in 1977. In 1985, he decided to establish the Oakville Martial Arts Club. In August 1988, the club changed DRAGON TIGER KUNG_FU CLUB in honor of the club by the same name established by his teachers in the Philippines. 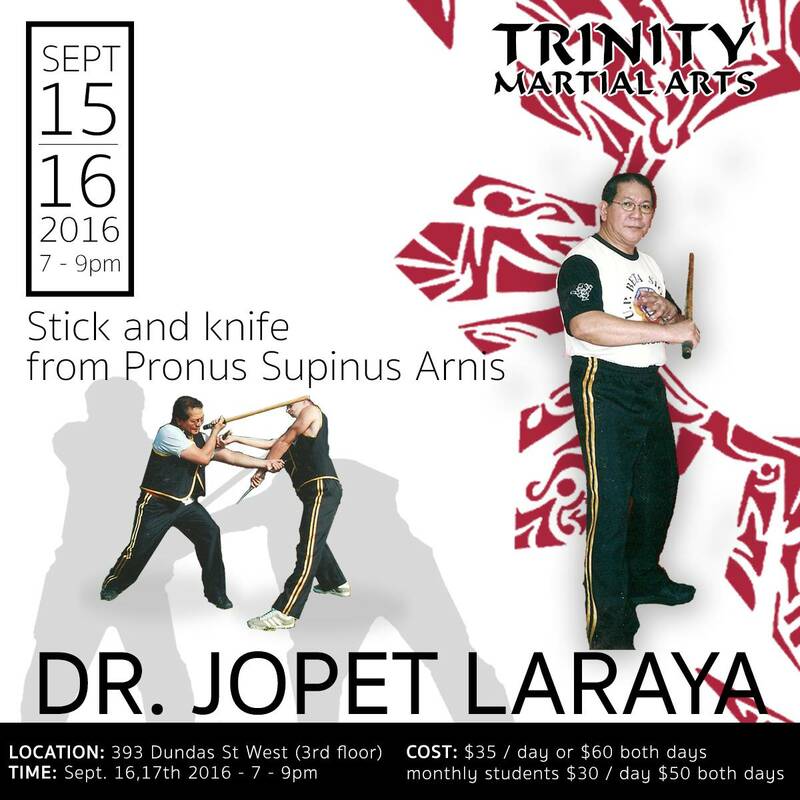 In 1985 he became the sole certified instructor in LAPUNTI Arnis de Abanico and the club the club authorized to teach LAPUNTI.